Don't Buy A Smith & Wesson M&P .40 Without Reading This Review! 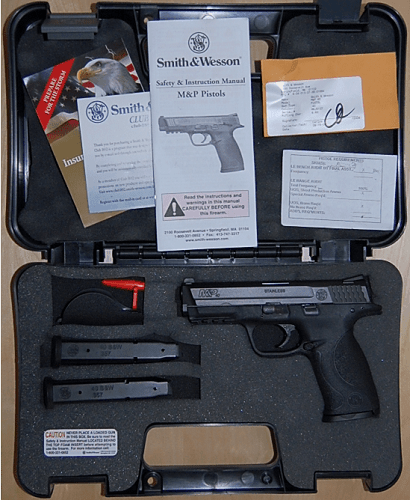 Blog Don’t Buy A Smith & Wesson M&P .40 Without Reading This Review! For those interested in looking up more information about my version of the Smith and Wesson M&P 40 via Smith & Wesson’s website, the SKU # for my handgun is 209300. For those of you completely unfamiliar with firearms, I have provided a side view picture at the end of this article for reference labeling most of the features found on the M&P 40. Should reviews for the M&P 9 and M&P 357 make their way onto the website, you will see a lot of overlap in information. This particular model from Smith & Wesson comes in three calibers, 9mm, .40 S&W, and 357 SIG. So aside from the performance and recoil differences between the three calibers, most of the physical aspects of the M&P 40 are identical to that of the M&P9 and M&P 357. It is no real surprise given the modular design of the M&P handgun line that the factory magazines used by the M&P 40 are stamped for the 357 SIG model as well. Since there is hardly any difference in outward appearances between the 9mm, .40 S&W, and .357 SIG models, the top of the barrel is stamped with the caliber used by the handgun. My M&P 40 came with a carrying case, three 15 round capacity magazines, a user manual, chamber plug, carrying case lock (not shown above) and three interchangeable grip backstraps. My particular model of Smith and Wesson M&P 40 is considered a base model as it does not have the optional ambidextrous thumb safety, internal lock, or a magazine lock installed. The one extra I did opt for when I purchased my M&P 40 is the Tritium night sights. I have put close to a thousand rounds down range with the three magazines experiencing no problems. Ergonomics: If the feel and fit of a handgun in your hand is absolutely paramount, the Smith and Wesson M&P 40, with its superior ergonomics, is sure to grab your attention. The M&P 40 clearly demonstrates why other gun manufacturers should pay attention to the ergonomics of their products. The releases and levers are large and easy to use. This handgun’s edges are rounded, tapered, and trimmed to present a cleaner looking profile. Straight out of the box, the M&P 40, with its ambidextrous controls, will draw favor from both left-handed or right-handed shooters alike. The magazine release button comes set for a right-handed shooter, but the manual shows you how to reverse the magazine release to accommodate a left-handed shooter. Because of the ambidextrous nature of the M&P 40, releasing the magazine and reloading this weapon can be done without having to switch hands in the process. attention to detail extends beyond the ambidextrous features. The angled wave design grip else on the back of the M&P’s slide is a unique feature I haven’t see really anywhere. This wave design allows for easier opening of the slide should your hands be wet or are wearing gloves. Safety Features: There are two safety features, loaded chamber indicator and integrated trigger safety, that you will find default in all M&P 40 models regardless of the version of M&P that you purchase. The first safety feature is a loaded chamber indicator located behind the caliber stamp on the barrel. The loaded chamber indicator is a hole in the top of the handgun. If a round is loaded in the chamber you will see the brass or silver-colored rim of the bullet showing when you look down into the indicator. In situations where you find pulling the slide back to check if the handgun is loaded is not feasible (noise discipline), the loaded chamber indicator is a great at-a-glance feature. The second safety feature is the integrated trigger safety. While I understand the intent of this safety feature, I am of the opinion that an integrated trigger safety ruins a perfectly, good trigger squeeze. Given the choice, I’d much prefer a pairing of a grip safety with an ambidextrous thumb safety (items found on certain types of 1911 handguns like the Taurus P1911) over any integrated trigger safety. I see M&P 40’s integrated trigger safety as the biggest detractor from an otherwise excellent handgun. Smith & Wesson’s trigger safety literally takes up half of the trigger. This safety feature forces the shooter to slide a finger down then into fire the handgun. My wife, father-in-law, and I found ourselves hitting the bottom part of the target when we first started out using the Smith & Wesson M&P 40 due to this safety feature. I have had to spend a considerable amount of time learning to compensate for the trigger safety in order to hit targets where I want them. Trigger Pull: The only so-so feature I’ve encountered outside of the trigger safety so far in the M&P 40 design is a trigger pull of 6.5 pounds needed to fire the handgun. In my opinion, 6.5 pounds is on the high side compared to other polymer frame handguns currently sold on the market. There is a competition trigger that you can buy and install to lower the trigger pull down to 4 pounds, but having to spend the extra money and ripping apart the M&P 40 all for a better trigger may be a detractor to some. Handling & Recoil: The M&P 40 is a very stable platform for the .40 S&W when compared to other brands with its taller profile and how well it fits into a shooter’s hand. Rapid firing 15 rounds from the M&P 40 accurately at a target 25 meters away is very doable I have found. The M& P40 does share some characteristics common with .40 S&W platform. .40 S&W based polymer frame handguns, in general, have a top-heavy feel to them and tend to produce a ‘snappy’ recoil that is felt mostly in the wrists. The M&P 40 is no different from others polymer frame handguns in this regard. My wife complains that the M&P 40 feels like it wants to jump out of her hands when she fires it. Personally, I find the recoil to be acceptable as the direction of the recoil is straight back. If this type of recoil is an issue for some, I’d recommend looking into the M&P 9 instead. Just keep in mind during the last ammunition shortage experienced in the United States, 9 mm was harder to come by than .40 S&W. Ammunition: Do NOT use +P+ (Plus-P-Plus) grade ammunition in this handgun. The overpressure created by this type of cartridge will ruin the M&P 40. I have run Winchester, CCI Blazer, and Federal through my M&P 40 without experiencing one misfeed or failure to fire. The M&P 40 handles home defense ammunition like a champ. I heard a while back that Fiocchi 170gr FMJTC (Full Metal Jacket Truncated Cone) rounds had a bad habit of causing M&P 40s problems, but since I do not use ammunition made by Fiocchi I do not view it as an issue. Maintenance and Lubrication: This is another aspect about the M&P40 that I give high marks for. Unlike traditional construction, the M&P40’s frame only connects to the slide in four places. When fully assembled, you can see a visible gap between the slide and frame. The advantage of this is fewer places for the carbon to bind up between the frame and slide. In many ways, this can be viewed as a self-cleaning feature as the points of contact scrape out the carbon in each pass. Lubricating the M&P 40 is not overly difficult as there are only 7 points that you need to make sure are lubricated on a regular basis. 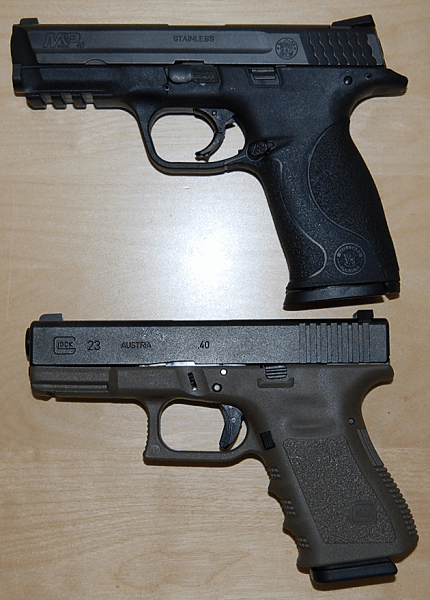 Glock 23 / M&P 40 comparison: To give everyone a better perspective of the M&P40, I have included a picture of my M&P 40 next to my Glock 23 (also chambered in .40 S&W) for comparing dimensions. Given that Glock is considered by many to be the most popular handgun manufacturer in the United States, I thought it only proper to use one as a point of reference in this review. The Glock 23 was purchased within one month of my purchase of the M&P 40 and has had the same number of rounds fired from it as the M&P 40 has. Both firearms have night sights installed. The M&P 40 is a larger handgun in comparison to the Glock 23. The M&P 40 is physically longer, a hair wider, heavier, and has a taller profile than that of the Glock. Looking at factory magazines only, the M&P 40 carries 2 more rounds at 15 due to its taller profile. People with wider hands will like the M&P 40’s taller frame better. On the surface, both firearms are as accurate as the shooter is. At 25 feet, 50 feet, and 75 feet, there is no real, discernible difference between the two firearms in the terms of accuracy. M&P 40’s .25” longer barrel it isn’t enough length difference to give it a definitive victory over the Glock 23 in long-range shooting. The advantage that M&P 40 has over the Glock 23 is more subtle in nature with the combination of the front and rear sights being farther apart, slightly longer barrel, and an adjustable rear sight. Even though the recoil generated by each handgun with the same brand of ammo is effectively the same, I have to give M&P 40 the edge since it fits better into the hand than does the Glock 23. As the magazines empty, the force of the recoil is felt more in both models. The Glock 23 is designed for a right-handed shooter as all controls for the handgun are located on the left side. The M&P 40 ambidextrous design and reversible magazine release throws a bone to left-handed shooters. The M&P 40 edges are rounded versus the blocky design favored by Glock. There is considerable tapering at the front end of the M&P 40 unlike the Glock 23 to allow for easier holstering of the weapon. The slide guard is much more pronounced on the M&P 40 offering better protection against the slide biting into the meaty part of your hand between your thumb and index finger as the slide moves backward to eject a spent casing. The M&P 40 is easier to load when your hands are wet with the angled wave design on the back of the slide. The M&P 40’s ability to swap out the back strap for different hand sizes if superior to that of Glock’s one size fits all approach in the Glock 23. The M& P40s equipment rail is longer and can accommodate a larger range of aftermarket items. The Glock 23 has a better-integrated trigger safety with it being centered in the lower middle of the trigger instead of consuming half of the trigger like the M&P 40’s does. The Glock 23’s integrated trigger safety allows for a more natural trigger squeeze and does not require any modification to a well-practiced trigger squeeze. Disassembling the handguns clearly falls in favor of the M&P 40. The Glock 23 takes a bit more practice to disassemble with its tiny takedown levers on both sides of the slide (both have to be engaged at the same time). The Glock has to be dry fired in order to remove the slide. The M&P 40’s large single takedown lever is gentler on smaller hands. Using the frame tool, the M&P 40’s slide can come off without dry firing by pushing down the yellow colored sear deactivation lever in the back of the chamber. People with fat fingers will find trying to get at the lever without the tool frustrating and end up dry firing the M&P 40 like the Glock in order to get the slide off (quicker that way too). I will admit that I am not a huge fan of polymer frame handguns as I prefer all metal ones like the 1911. It just means the manufacturer of a polymer frame handgun has to try harder to get my attention and win me over. Smith & Wesson M&P 40’s inexpensive price tag, quality, rugged reliability, and ergonomics are major reasons as to why I bought mine. There are a couple of issues that I have with the M&P40, but overall, the M&P40 handgun is a worthy addition to anyone’s collection. The anatomy of the M&P 40: Additional Review of the M&P 40: Jeff Quinn has a review on the M&P 40 worth a read. – http://www.gunblast.com/SW_MP.htm Disclaimer: I have no vested interested (financial or otherwise) in either Glock or Smith & Wesson outside of owning several of their products.